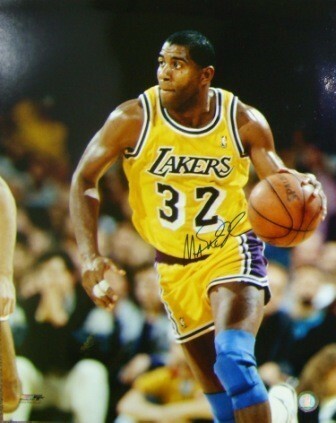 This 16x20 photo features Lakers legend Earvin "Magic" Johnson driving down the court. It was signed by Johnson during a private signing with Collectibles of the Game on April 25, 2007, and features a Collectibles of the Game and SuperStar Greetings hologram. It includes a Certificate of Authenticity from SuperStar Greetings, as well as a photo from the signing.